A team of specialist divers have been drafted in by police to trawl a wreck and the surrounding waters, where a diver vanished after surfacing. 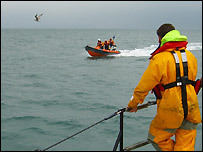 The 22-year-old man had been diving on the wreck of the Kyarra, off Anvil Point, off the Dorset coast. He was reported missing by the skipper of dive boat Killer Prawn on 22 August. A major search with a helicopter and five lifeboats failed to find the Northamptonshire man. A woman who went diving off the Kyarra is still missing. A spokesman from Dorset Police said: "A specialist team of sonar experts, a private company previously used by police forces for similar searches, will be carrying out - on behalf of Dorset Police - an examination of the wreck and the surrounding area - weather permitting. "Depending on what this search reveals an assessment will then be made as to the next course of action." On 4 August, a female diver from Cambs failed to resurface while exploring the Kyarra wreck from the same dive boat. A massive air and sea search failed to find any trace of her.